1.I am about replacing the valve spring seals and I cannot put the springs or coils back on the valves. I brought or borrowed NAPA and Advance tools but they were unhelpful at all. The NAPA tool has a larger nose that when the spring is compressed, you cannot push it back; it just won't sit. The Advance one is good when the head is separated from the block. I tried hammer and 14mm deep socket but too strong. Any home diy tool that I can use to push the coil back on? I don't want to buy the special tool off Amazon. 2. The two 1st exhaust lifters are stuck, but the others just came off easily. Any idea how to remove them? 3. If you notice from the pic, there is a shaving on the exhaust side. Why is it look like that? How to fix it? Last edited by Chris Samurai; 04-16-2019 at 03:19 PM. are using air or rope to hold up valve? Lisle 36050 works great for this. 1.I am about replacing the valve spring seals and I cannot put the spring or coil back on the valve. I brought or borrowed NAPA and Advance tools but they were unhelpful at all. The NAPA tool has a larger noise that when the spring is compressed, you cannot push it back; it just won't sit. The Advance one is good when the head is separated from the block. I tried hammer and 14mm deep socket but too strong. Any home diy tool that I can use to push the coil back on? I don't want to buy the special tool off Amazon. Exhaust valves look burnt and may need to be replaced. What condition is the valve seat under those exhaust valves. 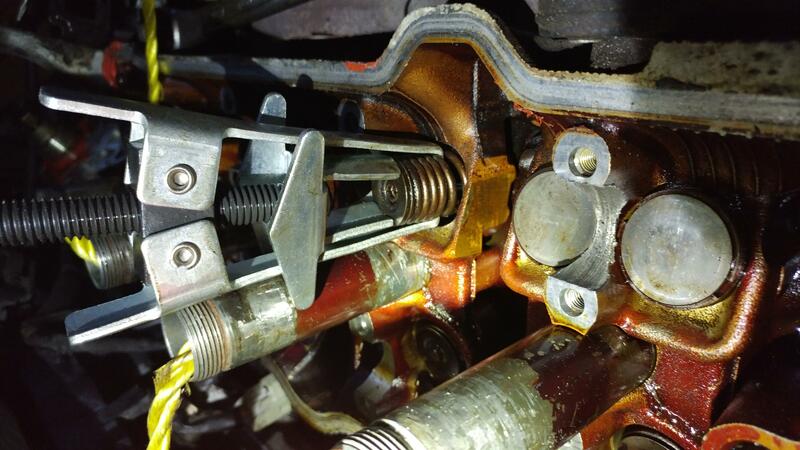 As mentioned what method are you using to keep the valve up while attempting to compress the spring? You might be able to rig your own, maybe with something like this and an oxygen sensor socket (with a side cutout)?? Not sure. Search eBay for item "00811652031294". As far as the stuck valve bucket. Pour some engine oil over it, and use a magnetic pickup tool to wiggle it. Make sure the seals are properly seated. If they come loose, your engine will consume oil quickly. Thanks netforcer for the awsome sig! You da man! 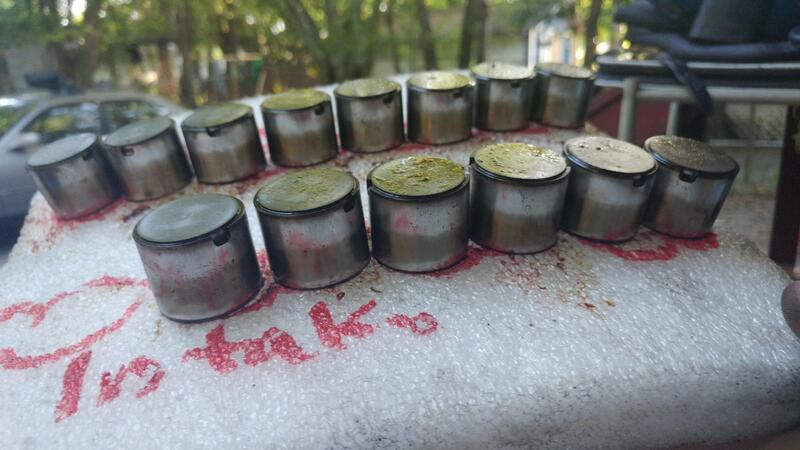 The valve fell into the cylinder, yes the journals in the head are baked you need at minimum a new cylinder head. I already ordered this tool because I am stranded. They may look shot, but the engine runs like a kitten. If I replace them, I might get the lifting noise. Thanks for the thread, but I am an intermediate mechanic, and too long to read it. Can we see some of the other journals? That one looks wiped like the metal has been overheated and stressed/deformed. That Lisle tool is for installing the keepers it won't help when the valve has fallen into the cylinder. The buckets are stuck because the cam bearing/journal is wiped to the point it mushroomed. That head is shot no matter what way you cut it. +3, or whatever it is. That head is toast because the one camshaft journal is galled badly. They should look smooth as glass. Yours looks like it was polished with gravel. And there should be a small hole at the bottom of the journal for the oil feed. Yours has been so boogered up it’s closed off. Doesn’t matter if the others are good (they probably aren’t), that one is in REALLY bad condition. If you build with it anyway, you’re building a bomb with a short fuse. Here are the rest of the cam bearings. Those are the valve lifters. The cam journals (aka: bearings) are what the cams rest in when they’re installed in the head. Not that is matters the head is junk but you didn't label the buckets/shims. There are a ton of better looking heads at my local Pick N Pull for about $80, maybe try one! I know what are you talking about. I will upload them tomorrow. There are two junkyard close to me. I probably stop by tomorrow.